Hackney Youth Parliament represents the views of young people in the borough. They aim to advocate on behalf of all their peers and contribute to positive change for all young people. They run campaigns about important issues, and hold regular events and consultations. There are currently twenty elected members of the 2018-20 Youth Parliament. 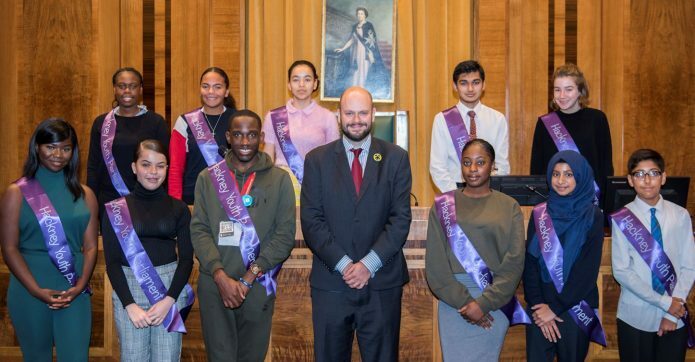 Elections took place in October 2018 and the Mayor of Hackney, Philip Glanville, announced the results in the Hackney Town Hall Chambers on. Our newly elected Youth Parliament are pumped and ready to influence change in our community. Keep your eyes peeled for their upcoming campaigns and exciting projects they are planning! Jodine Clarke, Aleigha Reeves, Eesa Sayed, Martha Lucas, Kofi Atiase, Omari Benson, Tapiwa Cronin, Sherri Dunbar, Ali Qasimi, Raivene Walters, Akram Hoque, Abdullahi Yusuf, Clive Kandza, Beverley Tetteh, Zita Salman, Rihanna Facey, Jubreel Ali-Arowosekila, Maariyah Patel, Evelyn Dumbleton, Mateenah Adeleke. Elections for Hackney Youth Parliament take place every two years – anyone aged 11-19 can stand as a candidate. You can get in touch with the Youth Parliament using the form below, by emailing yh.online@hackney.gov.uk or by calling 020 8356 2200 (10.00am – 5.00pm).